This document focuses on the high-level concepts of security within JBoss EAP and what components exist to implement those concepts. This document focuses on what and why and much less on how, meaning specifics on how to configure a specific scenario will be housed in other documents. When completing this document, readers should have a solid conceptual understanding of the components of security within JBoss EAP, as well as how those components fit together. Before digging into how JBoss EAP handles security, it is important to understand a few basic security concepts. Authentication refers to identifying a subject and verifying the authenticity of the identification. The most common authentication mechanism is a username and password combination, but other mechanisms, such as shared keys, smart cards or fingerprints, are also used for authentication. When in the context of Java Enterprise Edition declarative security, the result of a successful authentication is called a principal. Authorization refers to a way of specifying access rights or defining access policies. A system can then implement a mechanism to use those policies to permit or deny access to resources for the requester. In many cases, this is implemented by matching a principal with a set of actions or places they are allowed to access, sometimes referred to as a role. Though authentication and authorization are distinct concepts, they are often linked. Many modules written to handle authentication also handle authorization and vice versa. The application MyPersonalSoapbox provides the ability to post and view messages. Principals with the Talk role can post messages and view other posted messages. Users who have not logged in have the Listen role and can view posted messages. Suzy, Adam, and Bob use the application. Suzy and Bob can authenticate with their username and password, but Adam does not have a username and password yet. Suzy has the Talk role, but Bob does not have any roles, neither Talk nor Listen. When Suzy authenticates, she may post and view messages. When Adam uses MyPersonalSoapbox, he cannot log in, but he can see posted messages. When Bob logs in, he cannot post any messages, nor can he view any other posted messages. Suzy is both authenticated and authorized. Adam has not authenticated, but he is authorized, with the Listen role, to view messages. Bob is authenticated but has no authorization and no roles. Encryption refers to encoding sensitive information by applying mathematical algorithms to it. Data is secured by converting, or encrypting, it to an encoded format. To read the data again, the encoded format must be converted, or decrypted, to the original format. Encryption can be applied to simple string data in files or databases or even on data sent across communications streams. Examples of encryption include the following scenarios. LUKS can be used to encrypt Linux file system disks. The blowfish or AES algorithms can be used to encrypt data stored in Postgres databases. The HTTPS protocol encrypts all data via Secure Sockets Layer/Transport Layer Security, SSL/TLS, before transferring it from one party to another. When a user connects from one server to another using the Secure Shell, SSH protocol, all of the communication is sent in an encrypted tunnel. SSL/TLS encrypts network traffic between two systems by using a symmetric key that is exchanged between and only known by those two systems. To ensure a secure exchange of the symmetric key, SSL/TLS uses Public Key Infrastructure (PKI), a method of encryption that uses a key pair. A key pair consists of two separate but matching cryptographic keys: a public key and a private key. The public key is shared with any party and is used to encrypt data; the private key is kept secret and is used to decrypt data that has been encrypted using the public key. When a client requests a secure connection to exchange symmetric keys, a handshake phase occurs before secure communication can begin. During the SSL/TLS handshake, the server passes its public key to the client in the form of a certificate. The certificate contains the identity of the server, its URL, the public key of the server, and a digital signature that validates the certificate. The client validates the certificate and decides whether the certificate is trusted. If the certificate is trusted, the client generates the symmetric key for the SSL/TLS connection, encrypts it using the public key of the server, and sends it back to the server. The server uses its private key to decrypt the symmetric key. Further communication between the two machines over this connection is encrypted using the symmetric key. There are two kinds of certificates: self-signed certificates and authority-signed certificates. A self-signed certificate uses its private key to sign itself; that signature is unverified because it is not connected to a chain of trust. An authority-signed certificate is a certificate that is issued to a party by a certificate authority, CA, and is signed by that CA, for example, VeriSign, CAcert, RSA, et al. The CA verifies the authenticity of the certificate holder. Self-signed certificates can be faster and easier to generate and require less infrastructure to manage, but they can be difficult for clients to verify their authenticity because a third party has not confirmed their authenticity. This inherently makes the self-signed certificate less secure. Authority-signed certificates can take more effort to set up, but they are easier for clients to verify their authenticity. A chain of trust has been created because a third party has confirmed the authenticity of the certificate holder. Red Hat recommends that SSLv2, SSLv3, and TLSv1.0 be explicitly disabled in favor of TLSv1.1 or TLSv1.2 in all affected packages. Single sign-on (SSO) allows principals authenticated to one resource to implicitly authorize access to other resources. If a set of distinct resources is secured by SSO, a user is only required to authenticate the first time they access any of the secured resources. Upon successful authentication, the roles associated with the user are stored and used for authorization of all other associated resources. This allows the user to access any additional authorized resources without re-authenticating. If the user logs out of a resource or a resource invalidates the session programmatically, all persisted authorization data is removed and the process starts over. In the case of a resource session timeout, the SSO session is not invalidated if there are other valid resource sessions associated with that user. SSO may be used for authentication and authorization on web applications and desktop applications. In some cases, an SSO implementation can integrate with both. Within SSO, there are a few common terms used to describe different concepts and parts of the system. Identity Management (IDM) refers to the idea of managing principals and their associated authentication, authorization, and privileges across one or more systems or domains. The term Identity and Access Management (IAM) is sometimes used to describe this same concept. An identity provider (IDP) is the authoritative entity responsible for authenticating an end user and asserting the identity for that user in a trusted fashion to trusted partners. An identity provider needs an identity store to retrieve users' information to use during the authentication and authorization process. Identity stores can be any type of repository: a database, Lightweight Directory Access Protocol (LDAP), properties file, and so on. A service provider (SP) relies on an identity provider to assert information about a user via an electronic user credential, leaving the service provider to manage access control and dissemination based on a trusted set of user credential assertions. Non-clustered SSO limits the sharing of authorization information to applications on the same virtual host. There is also no resiliency in the event of a host failure. In a clustered SSO scenario, data can be shared between applications on multiple virtual hosts, which makes it resilient to failover. In addition, a clustered SSO is able to receive requests from a load balancer. Kerberos is a network authentication protocol for client-server applications. It uses secret-key symmetric cryptography to allow secure authentication across a non-secure network. Kerberos uses security tokens called tickets. To use a secured service, users need to obtain a ticket from the ticket granting service (TGS) which is a service that runs on a server in their network. After obtaining the ticket, users request a Service Ticket (ST) from an authentication service (AS) which is another service running in the same network. Users then use the ST to authenticate to the desired service. The TGS and the AS run inside an enclosing service called the key distribution center (KDC). Kerberos is designed to be used in a client-server desktop environment and is not usually used in web applications or thin client environments. However, many organizations use a Kerberos system for desktop authentication and prefer to reuse their existing system rather than create a second one for their web applications. Kerberos is an integral part of Microsoft’s Active Directory and is used in many Red Hat Enterprise Linux environments. Simple and protected GSS_API negotiation mechanism(SPNEGO) provides a mechanism for extending a Kerberos-based SSO environment for use in web applications. When an application on a client computer, such as a web browser, attempts to access a protected page on a web server, the server responds that authorization is required. The application then requests an ST from the KDC. The application wraps the ticket in a request formatted for SPNEGO and sends it back to the web application via the browser. The web container running the deployed web application unpacks the request and authenticates the ticket. Access is granted upon successful authentication. SPNEGO works with all types of Kerberos providers, including the Kerberos service within Red Hat Enterprise Linux and the Kerberos server, which is an integral part of Microsoft’s Active Directory. Active Directory (AD) is a directory service developed by Microsoft to authenticate users and computers in a Microsoft Windows domain. It comes as part of Windows Server. The computer running Windows Server controlling the domain is referred to as the domain controller. Red Hat Enterprise Linux can integrate with Active Directory domains as can Red Hat Identity Management, Red Hat JBoss Enterprise Application Platform, and other Red Hat products. One way to implement SSO is to use a claims-based identity system. A claims-based identity system allows systems to pass identity information but abstracts that information into two components: a claim and an issuer or authority. A claim is statement that one subject, such as a user, group, application, or organization, makes about another. That claim or set of claims is packaged into a token or set of tokens and issued by a provider. Claims-based identity allows individual secured resources to implement SSO without having to know everything about a user. A security token service (STS) is an authentication service that issues security tokens to clients for use when authenticating and authorizing users for secured applications, web services or EJBs. A client attempting to authenticate against an application secured with STS, known as a service provider, will be redirected to a centralized STS authenticator and issued a token. If successful, that client will reattempt to access the service provider, providing their token along with the original request. That service provider will validate the token from the client with the STS and proceed accordingly. This same token may be reused by the client against other web services or EJBs that are connected to the STS. The concept of a centralized STS that can issue, cancel, renew, and validate security tokens and specifies the format of security token request and response messages is known as WS-Trust. In browser-based SSO, one or more web applications, known as service providers, connect to a centralized identity provider in a hub and spoke architecture. The IDP acts as the central source, or hub, for identity and role information by issuing claim statements in SAML tokens to service providers, or spokes. Requests may be issued when a user attempts to access a service provider or if a user attempts to authenticate directly with the identity provider. These are known as SP-initiated and IDP-initiated flows, respectively, and will both issue the same claim statements. Security Assertion Markup Language (SAML) is a data format that allows two parties, usually an identity provider and a service provider, to exchange authentication and authorization information. A SAML token is a type of token issued by an STS or IDP; it can be used to enable SSO. A resource secured by SAML, SAML service provider, redirects users to the SAML identity provider, a type of STS or IDP, to obtain a valid SAML token before authenticating and authorizing that user. Desktop-based SSO enables service providers and desktop domains, for example Active Directory or Kerberos, to share a principal. In practice, this allows users to log in on their computer using their domain credentials and then have service providers reuse that principal during authentication, without having to re-authenticate, thus providing SSO. Lightweight Directory Access Protocol (LDAP) is a protocol for storing and distributing directory information across a network. This directory information includes information about users, hardware devices, access roles and restrictions, and other information. In LDAP, the distinguished name (DN), uniquely identifies an object in a directory. Each distinguished name must have a unique name and location from all other objects, which is achieved using a number of attribute-value pairs (AVPs). The AVPs define information such as common names and organization unit. The combination of these values results in a unique string required by the LDAP. Some common implementations of LDAP include Red Hat Directory Server, OpenLDAP, Active Directory, IBM Tivoli Directory Server, Oracle Internet Directory, and 389 Directory Server. 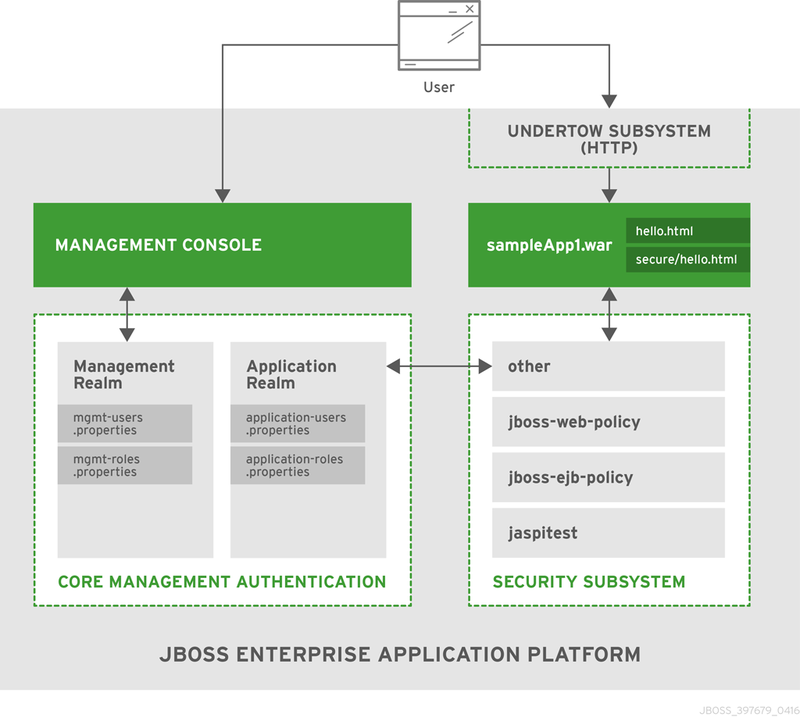 There are two components that ship with JBoss EAP 7 that relate to security: Core Management Authentication and the security subsystem. These two components are based on the general security concepts discussed in the Overview of General Security Concepts, but they also incorporate some JBoss EAP-specific concepts in their implementation discussed in the Red Hat JBoss Enterprise Application Platform-Specific Concepts section. In addition to the general security concept covered in the Overview of General Security Concepts section, it is important to understand some of the concepts specific to JBoss EAP and JBoss EAP security. JBoss EAP is built on the concept of modular class loading. Each API or service provided by JBoss EAP is implemented as a module, which is loaded and unloaded on demand. The core services are services that are always loaded on server startup and are required to be running prior to starting an additional subsystem. A subsystem is a set of capabilities added to the core server by an extension. Some example subsystems include a subsystem that provides servlet handling capabilities, a subsystem that provides an EJB container, and a subsystem that provides JTA. A profile is a named list of subsystems, along with the details of each subsystem’s configuration. A profile with a large number of subsystems results in a server with a large set of capabilities. A profile with a small, focused set of subsystems will have fewer capabilities but a smaller footprint. By default, JBoss EAP comes with several predefined profiles, for example default, full, ha, full-ha. In these profiles, the management interfaces and the associated security realms are loaded as core services. JBoss EAP offers two different management interfaces for interacting with and editing its configuration: the management console and the management CLI. Both interfaces expose the functionality of the core management of JBoss EAP. These interfaces offer two ways to access the same core management system. The management console is a web-based administration tool for JBoss EAP. It may be used to start and stop servers, deploy and undeploy applications, tune system settings, and make persistent modifications to the server configuration. The management console also has the ability to perform administrative tasks, with live notifications when any changes require the server instance to be restarted or reloaded. In a managed domain, server instances and server groups in the same domain can be centrally managed from the management console of the domain controller. The management CLI is a command line administration tool for JBoss EAP. The management CLI may be used to start and stop servers, deploy and undeploy applications, configure system settings, and perform other administrative tasks. Operations can be performed in batch mode, allowing multiple tasks to be run as a group. The management CLI may also connect to the domain controller in a managed domain to execute management operations on the domain. The management CLI can perform all tasks that the web-based administration tool can perform as well as many other lower-level operations that are unavailable to the web-based administration tool. In addition to the clients that ship with JBoss EAP, other clients can be written to invoke the management interfaces over either the HTTP or native interfaces using the APIs included with JBoss EAP. A security realm is effectively an identity store of usernames, passwords, and group membership information that can be used when authenticating users in EJBs, web applications, and the management interface. Initially, JBoss EAP comes preconfigured with two security realms by default: ManagementRealm and ApplicationRealm. Both security realms use the file system to store mappings between users and passwords and users and group membership information. They both use a digest mechanism by default when authenticating. A digest mechanism is an authentication mechanism that authenticates the user by making use of one-time, one-way hashes comprising various pieces of information, including information stored in the usernames and passwords mapping property file. This allows JBoss EAP to authenticate users without sending any passwords in plain text over the network. The JBoss EAP installation contains a script that enables administrators to add users to both realms. When users are added in this way, the username and hashed password are stored in the corresponding users/passwords properties file. When a user attempts to authenticate, JBoss EAP sends back a one-time use number, nonce, to the client. The client then generates a one-way hash using their username, password, nonce, and a few other fields and sends the username, nonce, and one-way hash to JBoss EAP. JBoss EAP looks up the user’s prehashed password and uses it, along with the provided username, nonce, and a few other fields, to generate another one-way hash in the same manner. If all the same information is used, for example, correct password, on both sides, hashes will match and the user is authenticated. Though security realms use the digest mechanism by default, they may be reconfigured to use other authentication mechanisms. On startup, the management interfaces determine which authentication mechanisms will be enabled based on what authentication mechanisms are configured in ManagementRealm. Security realms are not involved in any authorization decisions; however, they can be configured to load a user’s group membership information, which can subsequently be used to make authorization decisions. After a user has been authenticated, a second step occurs to load the group membership information based on the username. By default, the ManagementRealm is used during authentication and authorization for the management interfaces. The ApplicationRealm is a default realm made available for web applications and EJBs to use when authenticating and authorizing users. A security domain is a set of Java Authentication and Authorization Service (JAAS) declarative security configurations that one or more applications use to control authentication, authorization, auditing, and mapping. Four security domains are included by default: jboss-ejb-policy, jboss-web-policy, other, and jaspitest. The jboss-ejb-policy and jboss-web-policy security domains are the default authorization mechanisms that are used if an application’s configured security domain has none. Those security domains, along with other, are also used internally within JBoss EAP for authorization and are required for correct operation. The jaspitest security domain is a simple JASPI security domain included for development purposes. A security domain comprises configurations for authentication, authorization, security mapping, and auditing. Security domains are part of the JBoss EAP security subsystem and are managed centrally by the domain controller or standalone server. Users can create as many security domains as needed to accommodate application requirements. Security realms and security domains can be used as a part of securing web applications deployed to JBoss EAP. When deciding if either should be used, it is important to understand the difference between the two. Web applications and EJB deployments can only use security domains directly. They perform the actual authentication and authorization via login modules using the identity information passed from an identity store. Security domains can be configured to use security realms for identity information; for example, other allows applications to specify a security realm to use for authentication and getting authorization information. They may also be configured to use external identity stores. Web applications and EJB deployments cannot be configured to directly use security realms for authentication. The security domains are also part of the security subsystem and are loaded after core services. Only the core management, for example, the management interfaces, and the EJB remoting end points can use the security realms directly. They are identity stores that provide authentication as well as authorization information. They are also a core service and are loaded before any subsystems are started. The out-of-the-box security realms, ManagementRealm and ApplicationRealm, use a simple file-based authentication mechanism, but they can be configured to use other mechanisms. Security auditing refers to triggering events, such as writing to a log, in response to an event that happens within the security subsystem. Auditing mechanisms are configured as part of a security domain, along with authentication, authorization, and security mapping details. Auditing uses provider modules to control the way that security events are reported. JBoss EAP ships with several security auditing providers, but custom ones may be used. The core management of JBoss EAP also has its own security auditing and logging functionality, which is configured separately and is not part of the security subsystem. Security mapping adds the ability to combine authentication and authorization information after the authentication or authorization happens but before the information is passed to your application. Roles for authorization, principals for authentication, or credentials which are attributes that are not principals or roles, may all be mapped. Role mapping is used to add, replace, or remove roles to the subject after authentication. Principal mapping is used to modify a principal after authentication. Credential mapping is used to convert attributes from an external system to be used by your application and vice versa. Java Management Extensions (JMX) provides a way to remotely trigger JDK and application management operations. The management API of JBoss EAP is exposed as JMX managed beans. These managed beans are referred to as core mbeans, and access to them is controlled and filtered exactly the same as the underlying management API itself. In addition to the management CLI and management console, JMX-exposed beans are an alternative mechanism to access and perform management operations. Role-Based Access Control (RBAC) is a mechanism for specifying a set of permissions for management users. It allows multiple users to share responsibility for managing JBoss EAP servers without each of them requiring unrestricted access. By providing a separation of duties for management users, JBoss EAP makes it easy for an organization to spread responsibility between individuals or groups without granting unnecessary privileges. This ensures the maximum possible security of your servers and data while still providing flexibility for configuration, deployment, and management. RBAC in JBoss EAP works through a combination of role permissions and constraints. Seven predefined roles are provided, with every role having different fixed permissions. Each management user is assigned one or more roles that specify what the user is permitted to do when managing the server. RBAC is disabled by default. JBoss EAP provides seven predefined user roles: Monitor, Operator, Maintainer, Deployer, Auditor, Administrator, and SuperUser. Each role has a different set of permissions and is designed for specific use cases. The Monitor, Operator, Maintainer, Administrator, and SuperUser roles build successively upon each other, with each having more permissions than the previous. The Auditor and Deployer roles are similar to the Monitor and Maintainer roles, respectively, but they have some special permissions and restrictions. Users of the Monitor role have the fewest permissions and can only read the current configuration and state of the server. This role is intended for users who need to track and report on the performance of the server. Monitor cannot modify server configuration, nor can they access sensitive data or operations. The Operator role extends the Monitor role by adding the ability to modify the runtime state of the server. This means that Operator can reload and shutdown the server as well as pause and resume JMS destinations. The Operator role is ideal for users who are responsible for the physical or virtual hosts of the application server so they can ensure that servers can be shutdown and restarted correctly when need be. Operator cannot modify server configuration or access sensitive data or operations. The Maintainer role has access to view and modify the runtime state and all configurations except sensitive data and operations. The Maintainer role is the general purpose role that does not have access to sensitive data and operation. The Maintainer role allows users to be granted almost complete access to administer the server without giving those users access to passwords and other sensitive information. Maintainer cannot access sensitive data or operations. The Administrator role has unrestricted access to all resources and operations on the server except the audit logging system. The Administrator role has access to sensitive data and operations. This role can also configure the access control system. The Administrator role is only required when handling sensitive data or configuring users and roles. Administrator cannot access the audit logging system and cannot change themselves to the Auditor or SuperUser role. The SuperUser role does not have any restrictions, and it has complete access to all resources and operations of the server, including the audit logging system. If RBAC is disabled, all management users have permissions equivalent to the SuperUser role. The Deployer role has the same permissions as the Monitor, but it can modify the configuration and state for deployments and any other resource type enabled as an application resource. The Auditor role has all the permissions of the Monitor role and can also view, but not modify, sensitive data. It has full access to the audit logging system. The Auditor role is the only role besides SuperUser that can access the audit logging system. Auditor cannot modify sensitive data or resources. Only read access is permitted. Permissions determine what each role can do; not every role has every permission. Notably, SuperUser has every permission and Monitor has the least. Each permission can grant read and/or write access for a single category of resources. The categories are runtime state, server configuration, sensitive data, the audit log, and the access control system. 1 Permissions are restricted to application resources. 2 Which resources are considered to be sensitive data are configured using sensitivity. Constraints are named sets of access-control configuration for a specified list of resources. The RBAC system uses the combination of constraints and role permissions to determine if any specific user can perform a management action. Constraints are divided into three classifications. Application Constraints define sets of resources and attributes that can be accessed by Deployer users. By default, the only enabled Application Constraint is core, which includes deployments and deployment overlays. Application Constraints are also included, but not enabled by default, for data sources, logging, mail, messaging, naming, resource-adapters, and security. These constraints allow Deployer users to not only deploy applications, but also configure and maintain the resources that are required by those applications. Sensitivity Constraints define sets of resources that are considered sensitive. A sensitive resource is generally one that is either secret, like a password, or one that will have serious impact on the operation of the server, like networking, JVM configuration, or system properties. The access control system itself is also considered sensitive. The only roles permitted to write to sensitive resources are Administrator and SuperUser. The Auditor role is only able to read sensitive resources. No other roles have access. The Vault Expression Constraint defines if reading and writing vault expressions are considered sensitive operations. By default, reading and writing vault expressions are sensitive operations. Declarative security is a method to separate security concerns from application code by using the container to manage security. The container provides an authorization system based on either file permissions or users, groups, and roles. This approach is usually superior to programmatic security, which gives the application itself all of the responsibility for security. JBoss EAP provides declarative security by using security domains in the security subsystem. Java Authentication and Authorization Service (JAAS), is a declarative security API comprising a set of Java packages designed for user authentication and authorization. The API is a Java implementation of the standard Pluggable Authentication Modules (PAM) framework. It extends the Java EE access control architecture to support user-based authorization. 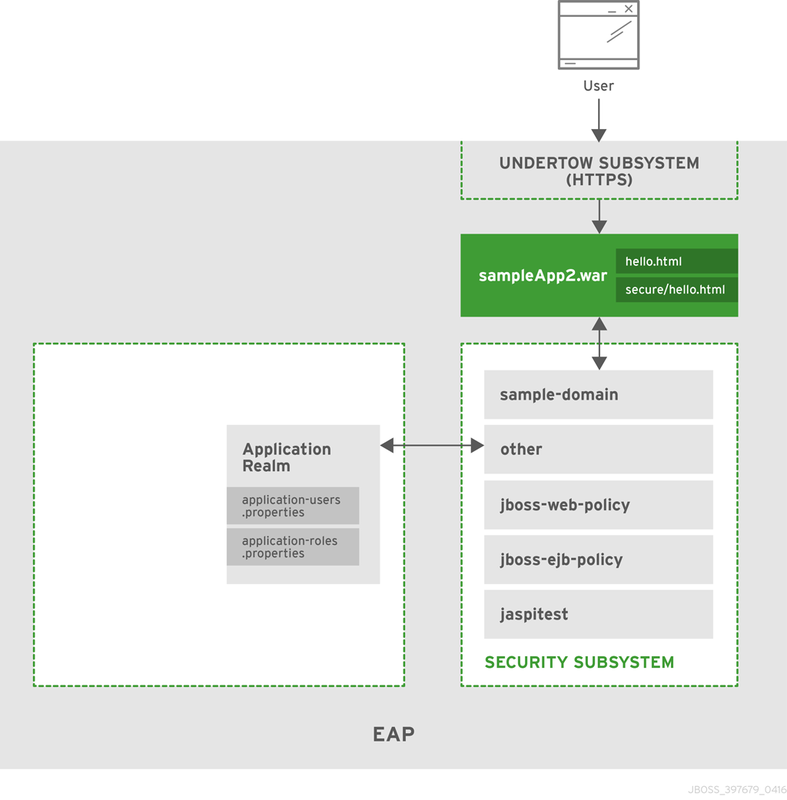 The JBoss EAP security subsystem is actually based on the JAAS API. Because JAAS is the foundation for the security subsystem, authentication is performed in a pluggable fashion. This permits Java applications to remain independent from underlying authentication technologies, such as Kerberos or LDAP, and allows the security manager to work in different security infrastructures. Integration with a security infrastructure is achievable without changing the security manager implementation. Only the configuration of the authentication stack that JAAS uses needs to be changed. Core Management Authentication is responsible for securing the management interfaces, HTTP and native, for the core management functionality using the ManagementRealm. It is built into the core management and is enabled and configured as a core service by default. It is only responsible for securing the management interfaces. By default, the Core Management Authentication secures each of the management interfaces, HTTP and native, in two different forms: local clients and remote clients, both of which are configured using the ManagementRealm security realm by default. These defaults may be configured differently or replaced entirely. Out of the box, the management interfaces are configured to use simple access controls, which does not use roles. As a result, all users by default, when using simple access controls, have the same privileges as the SuperUser Role, which essentially has access to everything. The native interface, or management CLI, can be invoked locally on the same host as the running JBoss EAP instance or remotely from another machine. When attempting to connect using the native interface, JBoss EAP presents the client with a list of available SASL authentication mechanisms, for example, local jboss user, BASIC, etc. The client chooses its desired authentication mechanism and attempts to authenticate with the JBoss EAP instance. If it fails, it retries with any remaining mechanisms or stops attempting to connect. Local clients have the option to use the local jboss user authentication mechanism. This security mechanism is based on the client’s ability to access the local file system. It validates that the user attempting to log in actually has access to the local file system on the same host as the JBoss EAP instance. The client sends a message to the server that includes a request to authenticate using local jboss user. The server generates a one-time token, writes it to a unique file, and sends a message to the client with the full path of the file. The client reads the token from the file and sends it to the server, verifying that it has local access to the file system. The server verifies the token and then deletes the file. This form of authentication is based on the principle that if physical access to the file system is achieved, other security mechanisms are superfluous. The reasoning is that if a user has local file system access, that user has enough access to create a new user or otherwise thwart other security mechanisms put in place. This is sometimes referred to as silent authentication because it allows the local user to access the management CLI without username or password authentication. This functionality is enabled as a convenience and to assist local users running management CLI scripts without requiring additional authentication. It is considered a useful feature given that access to the local configuration typically also gives the user the ability to add their own user details or otherwise disable security checks. The native interface can also be accessed from other servers, or even the same server, as a remote client. When accessing the native interface as a remote client, clients will not be able to authenticate using local jboss user and will be forced to use another authentication mechanism, for example, DIGEST. If a local client fails to authenticate by using local jboss user, it will automatically fall back and attempt to use the other mechanisms as a remote client. The management CLI may be invoked from other servers, or even the same server, using the HTTP interface as opposed to the native interface. All HTTP connections, CLI or otherwise, are considered to be remote and NOT covered by local interface authentication. By default, the native interface is not configured, and all management CLI traffic is handled by the HTTP interface. JBoss EAP 7 supports HTTP upgrade, which allows a client to make an initial connection over HTTP but then send a request to upgrade that connection to another protocol. In the case of the management CLI, an initial request over HTTP to the HTTP interface is made, but then the connection is upgraded to the native protocol. This connection is still handled over the HTTP interface, but it is using the native protocol for communication rather than HTTP. Alternatively, the native interface may still be enabled and used if desired. The HTTP interface can be invoked locally by clients on the same host as the running JBoss EAP instance or remotely by clients from another machine. Despite allowing local and remote clients to access the HTTP interface, all clients accessing the HTTP interface are treated as remote connections. When a client attempts to connect to the HTTP management interfaces, JBoss EAP sends back an HTTP response with a status code of 401 Unauthorized, and a set of headers that list the supported authentication mechanisms, for example, Digest, GSSAPI, and so on. The header for Digest also includes the nonce generated by JBoss EAP. The client looks at the headers and chooses which authentication method to use and sends an appropriate response. In the case where the client chooses Digest, it prompts the user for their username and password. The client uses the supplied fields such as username and password, the nonce, and a few other pieces of information to generate a one-way hash. The client then sends the one-way hash, username, and nonce back to JBoss EAP as a response. JBoss EAP takes that information, generates another one-way hash, compares the two, and authenticates the user based on the result. There are a number of ways to change the default configuration of management interfaces as well as the authentication and authorization mechanisms to affect how it is secured. In addition to modifying the Authentication and Authorization mechanisms, JBoss EAP allows administrators to update the configuration of the management interface itself. There are a number of options. Configuring the JBoss EAP management console for communication only via HTTPS provides increased security. All network traffic between the client and management console is encrypted, which reduces the risk of security attacks, such as a man-in-the-middle attack. Anyone administering a JBoss EAP instance has greater permissions on that instance than non-privileged users, and using HTTPS helps protect the integrity and availability of that instance. When configuring HTTPS with JBoss EAP, authority-signed certificates are preferred over self-signed certificates because they provide a chain of trust. Self-signed certificates are permitted but are not recommended. Two-Way SSL/TLS authentication, also known as client authentication, authenticates the client and the server using SSL/TLS certificates. This provides assurance that not only is the server what it says it is, but the client is also what it says it is. The default security realm can be updated or replaced with a new security realm. Some security realms connect to external interfaces, such as an LDAP server. An outbound connection defines how to make this connection. A predefined connection type, ldap-connection, sets all of the required and optional attributes to connect to the LDAP server and verify the credential. By default the RBAC system is disabled. It is enabled by changing the provider attribute from simple to rbac. This can be done using the management CLI. When RBAC is disabled or enabled on a running server, the server configuration must be reloaded before it takes effect. When RBAC is enabled for the management interfaces, the role assigned to a user determines the resources to which they have access and what operations they can conduct with a resource’s attributes. Only users of the Administrator or SuperUser role can view and make changes to the access control system. Enabling RBAC without having users and roles properly configured could result in administrators being unable to log in to the management interfaces. In the management console, some controls and views are disabled, which show up as grayed out, or not visible at all, depending on the permissions of the role the user has been assigned. If the user does not have read permissions to a resource attribute, that attribute will appear blank in the console. For example, most roles cannot read the username and password fields for data sources. If the user has read permissions but does not have write permissions to a resource attribute, that attribute will be disabled in the edit form for the resource. If the user does not have write permissions to the resource, the edit button for the resource will not appear. If a user does not have permissions to access a resource or attribute, meaning it is unaddressable for that role, it will not appear in the console for that user. An example of that is the access control system itself, which is only visible to a few roles by default. View and configure what roles are assigned to, or excluded from, each user. View and configure what roles are assigned to, or excluded from, each group. View group and user membership per role. Configure default membership per role. Constraints cannot be configured in the management console at this time. Users of the management CLI or management API will encounter slightly different behavior when RBAC is enabled. Resources and attributes that cannot be read are filtered from results. If the filtered items are addressable by the role, their names are listed as filtered-attributes in the response-headers section of the result. If a resource or attribute is not addressable by the role, it is not listed. Attempting to access a resource that is not addressable will result in a resource not found error. If a user attempts to write or read a resource that they can address but lacks the appropriate write or read permissions, a Permission Denied error is returned. The management API of JBoss EAP is exposed as JMX managed beans. These managed beans are referred to as core mbeans, and access to them is controlled and filtered exactly the same as the underlying management API itself. The jmx subsystem is configured with write permissions being sensitive. This means only users of the Administrator and SuperUser roles can make changes to that subsystem. Users of the Auditor role can also read this subsystem configuration. By default, managed beans registered by deployed applications and services, or non-core mbeans, can be accessed by all management users, but only users of the Maintainer, Operator, Administrator, and SuperUser roles can write to them. Users are authenticated using a username and password combination that is verified according to the settings of the ManagementRealm, which has the ability to use a local properties file or LDAP. The truststore provides authentication information for client certificates. jboss-cli script authenticates automatically as local jboss user if the server is running on the same machine. By default local jboss user is a member of the SuperUser group. Regardless of which provider is used, JBoss EAP is responsible for assigning roles to users. When authenticating with the ManagementRealm or an LDAP server, those systems can supply user group information. This information can also be used by JBoss EAP to assign roles to users. JBoss EAP includes several authentication and authorization modules that allow an LDAP server to be used as the authentication and authorization authority for web and EJB applications. Create an outbound connection to the LDAP server. Create an LDAP-enabled security realm or update an existing security realm to use LDAP. Reference the new security realm in the management interface. The LDAP authenticator operates by first establishing a connection to the remote directory server. It then performs a search using the username, which the user passed to the authentication system, to find the fully qualified distinguished name (DN) of the LDAP record. A new connection to the LDAP server is established, using the DN of the user as the credential and password supplied by the user. If this authentication to the LDAP server is successful, the DN is verified as valid. Once an LDAP-enabled security realm is created, it can be referenced by the management interface. The management interface will use the security realm for authentication. JBoss EAP can also be configured to use an outbound connection to an LDAP server using two-way SSL/TLS for authentication in the management interface and management CLI. JAAS can be used to secure the management interfaces. When using JAAS for the management interfaces, the security realm must be configured to use a security domain. This introduces a dependency between core services and the subsystems. While SSL/TLS is not required to use JAAS to secure the management interfaces, it is recommended that administrators enable SSL/TLS to avoid accidentally transmitting sensitive information in an unsecured manner. When JBoss EAP instances are running in admin-only mode, using JAAS to secure the management interfaces is not supported. For more information on admin-only mode, see Running JBoss EAP in Admin-Only Mode in the JBoss EAP Configuration Guide. The security subsystem provides security infrastructure for applications and is based on the JAAS API. The subsystem uses a security context associated with the current request to expose the capabilities of the authentication manager, authorization manager, audit manager, and mapping manager to the relevant container. The authentication and authorization managers handle authentication and authorization. The mapping manager handles adding, modifying, or deleting information from a principal, role, or attribute before passing the information to your application. The auditing manager allows users to configure provider modules to control the way that security events are reported. In most cases, administrators should need to focus only on setting up and configuring security domains in regards to updating the configuration of the security subsystem. Outside of security domains, the only security element that may need to be changed is whether to use deep-copy-subject-mode. In the rare case that security elements require changes, those configuration changes, as well as deep-copy-subject-mode, may be found in the Security Management section of the security subsystem. JBoss EAP has a Password Vault to encrypt sensitive strings, store them in an encrypted keystore, and decrypt them for applications and verification systems. In plain text configuration files, such as XML deployment descriptors, it is sometimes necessary to specify passwords and other sensitive information. The JBoss EAP Password Vault can be used to securely store sensitive strings for use in plain text files. Security domains are configured centrally either at the domain controller or on the standalone server. When security domains are used, an application may be configured to use a security domain in lieu of individually configuring security. This allows users and administrators to leverage Declarative Security. One common scenario that benefits from this type of configuration structure is the process of moving applications between testing and production environments. If an application has its security individually configured, it may need to be updated every time it is promoted to a new environment, for example, from a testing environment to a production environment. If that application used a security domain instead, the JBoss EAP instances in the individual environments would have their security domains properly configured for the current environment, allowing the application to rely on the container to provide the proper security configuration, using the security domain. JBoss EAP includes several bundled login modules suitable for most user management roles that are configured within a security domain. The security subsystem offers some core login modules that can read user information from a relational database, an LDAP server, or flat files. In addition to these core login modules, JBoss EAP provides other login modules that provide user information and functionality for customized needs. The Ldap login module is a login module implementation that authenticates against an LDAP server. The security subsystem connects to the LDAP server using connection information, that is, a bindDN that has permissions to search the baseCtxDN and rolesCtxDN trees for the user and roles, provided using a JNDI initial context. When a user attempts to authenticate, the LDAP login module connects to the LDAP server and passes the user’s credentials to the LDAP server. Upon successful authentication, an InitialLDAPContext is created for that user within JBoss EAP, populated with the user’s roles. The LdapExtended login module searches for the user to bind, as well as the associated roles, for authentication. The roles query recursively and follow DNs to navigate a hierarchical role structure. The login module options include whatever options are supported by the chosen LDAP JNDI provider supports. The UsersRoles login module is a simple login module that supports multiple users and user roles loaded from Java properties files. The primary purpose of this login module is to easily test the security settings of multiple users and roles using properties files deployed with the application. The Database login module is a Java Database Connectivity-based (JDBC) login module that supports authentication and role mapping. This login module is used if username, password, and role information are stored in a relational database. This works by providing a reference to logical tables containing principals and roles in the expected format. The Certificate login module authenticates users based on X509 certificates. A typical use case for this login module is CLIENT-CERT authentication in the web tier. This login module only performs authentication and must be combined with another login module capable of acquiring authorization roles to completely define access to secured web or EJB components. Two subclasses of this login module, CertRolesLoginModule and DatabaseCertLoginModule, extend the behavior to obtain the authorization roles from either a properties file or database. The Identity login module is a simple login module that associates a hard-coded username to any subject authenticated against the module. It creates a SimplePrincipal instance using the name specified by the principal option. This login module is useful when a fixed identity is required to be provided to a service. This can also be used in development environments for testing the security associated with a given principal and associated roles. The RunAs login module is a helper module that pushes a run as role onto the stack for the duration of the login phase of authentication; it then pops the run as role from the stack in either the commit or abort phase. The purpose of this login module is to provide a role for other login modules that must access secured resources to perform their authentication, for example, a login module that accesses a secured EJB. The RunAs login module must be configured ahead of the login modules that require a run as role established. The Client login module is an implementation of a login module for use by JBoss clients when establishing caller identity and credentials. This creates a new SecurityContext, assigns it a principal and a credential, and sets the SecurityContext to the ThreadLocal security context. The Client login module is the only supported mechanism for a client to establish the current thread’s caller. Both standalone client applications and server environments, acting as JBoss EJB clients where the security environment has not been configured to use the JBoss EAP security subsystem transparently, must use the Client login module. This login module does not perform any authentication. It merely copies the login information provided to it into the server EJB invocation layer for subsequent authentication on the server. Within JBoss EAP, this is only supported for switching a user’s identity for in-JVM calls. This is NOT supported for remote clients to establish an identity. The SPNEGO login module is an implementation of a login module that establishes caller identity and credentials with a KDC. The module implements SPNEGO and is a part of the JBoss Negotiation project. This authentication can be used in the chained configuration with the AdvancedLdap login module to allow cooperation with an LDAP server. Web applications must also enable the NegotiationAuthenticator within the application to use this login module. The RoleMapping login module supports mapping roles that are the end result of the authentication process to one or more declarative roles. For example, if the authentication process has determined that the user John has the roles ldapAdmin and testAdmin, and the declarative role defined in the web.xml or ejb-jar.xml file for access is admin, then this login module maps the ldapAdmin and testAdmin roles to John. The RoleMapping login module must be defined as an optional module to a login module configuration as it alters mapping of the previously mapped roles. The Remoting login module checks if the request that is currently being authenticated was received over the Remoting connection. In cases where the request was received using the remoting interface, that request is associated with the identity created during the authentication process. The RealmDirect login module allows an existing security realm to be used in making authentication and authorization decisions. When configured, this module will look up identity information using the referenced realm for making authentication decisions and mapping user roles. For example, the preconfigured other security domain that ships with JBoss EAP has a Realm Direct login module. If no realm is referenced in this module, the ApplicationRealm security realm is used by default. In cases where the login modules bundled with the JBoss EAP security framework do not meet the needs of the security environment, a custom login module implementation may be written. The AuthenticationManager requires a particular usage pattern of the Subject principals set. A full understanding of the JAAS Subject class’s information storage features and the expected usage of these features are required to write a login module that works with the AuthenticationManager. The UnauthenticatedIdentity login module option is also commonly used. There are certain cases when requests are not received in an authenticated format. The Unauthenticated Identity is a login module configuration option that assigns a specific identity, for example, guest, to requests that are made with no associated authentication information. This can be used to allow unprotected servlets to invoke methods on EJBs that do not require a specific role. Such a principal has no associated roles and can only access either unsecured EJBs or EJB methods that are associated with the unchecked permission constraint. Multiple login modules can be chained together in a stack, with each login module providing the credentials verification and role assignment during authentication. This works for many use cases, but sometimes credentials verification and role assignment are split across multiple user management stores. Consider the case where users are managed in a central LDAP server and application-specific roles are stored in the application’s relational database. The password-stacking module option captures this relationship. To use password stacking, each login module should set the password-stacking attribute to useFirstPass, which is located in the <module-option> section. If a previous module configured for password stacking has authenticated the user, all the other stacking modules will consider the user authenticated and only attempt to provide a set of roles for the authorization step. When the password-stacking option is set to useFirstPass, this module first looks for a shared username and password under the property names javax.security.auth.login.name and javax.security.auth.login.password, respectively, in the login module shared state map. If found, these properties are used as the principal name and password. If not found, the principal name and password are set by this login module and stored under the property names javax.security.auth.login.name and javax.security.auth.login.password, respectively. Most login modules must compare a client-supplied password to a password stored in a user management system. These modules generally work with plain text passwords, but they can be configured to support hashed passwords to prevent plain text passwords from being stored on the server side. JBoss EAP supports the ability to configure the hashing algorithm, encoding, and character set as well as define when the user password and store password are hashed. Red Hat JBoss Enterprise Application Platform Common Criteria certified configuration does not support hash algorithms weaker than SHA-256. The security management portion of the security subsystem is used to override the high-level behaviors of the security subsystem. Each setting is optional. It is unusual to change any of these settings except for the deep copy subject mode. If the deep copy subject mode is disabled, with it is by default, copying a security data structure makes a reference to the original rather than copying the entire data structure. This behavior is more efficient, but it is prone to data corruption if multiple threads with the same identity clear the subject by means of a flush or logout operation. If the deep copy subject mode is enabled, a complete copy of the data structure, along with all its associated data as long as they are marked cloneable, is made. This is more thread-safe but less efficient. Java Authentication SPI for Containers (JASPI or JASPIC) is a pluggable interface for Java applications and is defined in JSR-196. In addition to JAAS authentication, JBoss EAP allows for JASPI authentication to be used. JASPI authentication is configured using login modules in a security domain, and those modules may be stacked. The jaspitest security domain is a simple JASPI security domain that is included by default for development purposes. The web-based management console does not expose the configuration of JASPI authentication modules. Applications deployed to JBoss EAP require a special authenticator to be configured in their deployment descriptor to use JASPI security domains. Java Authorization Contract for Containers (JACC) is a standard that defines a contract between containers and authorization service providers, which results in the implementation of providers for use by containers. It was defined in JSR-115 and has been part of the core Java EE specification since version 1.3. JBoss EAP implements support for JACC within the security functionality of the security subsystem. fine-grained authorization caters to the changing requirements and multiple variables involved in the decision-making process, which becomes the basis of providing authorization for accessing a module. Hence, the process of fine-grained authorization is complex in itself. The XACML bindings, for web or EJB, are not supported in JBoss EAP. JBoss EAP uses XACML as a medium to achieve fine-grained authorization. XACML provides standards-based solution to the complex nature of achieving fine-grained authorization. XACML defines a policy language and an architecture for decision making. The XACML architecture includes a Policy Enforcement Point (PEP) which intercepts any requests in a normal program flow and asks a Policy Decision Point (PDP) to make an access decision based on the policies associated with the PDP. The PDP evaluates the XACML request created by the PEP and runs through the policies to make one of the following access decisions. There is an error at the PDP. There is some attribute missing in the request or there is no policy match. A configured security domain that handles authentication and authorization. The SSO infinispan replication cache. It is present in the ha and full-ha profiles for a managed domain, or by using the standalone-ha.xml or standalone-full-ha.xml configuration files for a standalone server. The web cache-container and SSO replication cache within it must be present. The undertow subsystem needs to be configured to use SSO. Each application that will share the SSO information must be configured to use the same security domain. In addition to the out-of-the-box functionality, JBoss EAP supports additional use cases for SSO, including SAML for browser-based SSO, desktop-based SSO, and SSO via a secure token service. In a browser-based SSO scenario, one or more web applications, known as service providers, are connected to a centralized identity provider in a hub-and-spoke architecture. The identity provider (IDP) acts as the central source, or hub, for identity and role information to all the service providers, or spokes. When an unauthenticated user attempts to access one of the service providers, that user is redirected to an IDP to perform the authentication. The IDP authenticates the user, issues a SAML token specifying the role of the principal, and redirects them to the requested service provider. From there, that SAML token is used across all of the associated service providers to determine the user’s identity and access. This specific method of using SSO starting at the service providers is known as a service provider-initiated flow. Like many SSO systems, JBoss EAP uses IDPs and SPs. Both of these components are enabled to be run within JBoss EAP instances and work in conjunction with the JBoss EAP security subsystem. SAML v2, FORM-based web application security, and HTTP/POST and HTTP/Redirect Bindings are also used to implement SSO. To create an identity provider, create a security domain, for example idp-domain, in a JBoss EAP instance that defines an authentication and authorization mechanism, for example LDAP or a database, to serve as the identity store. A web application, for example IDP.war, is configured to use additional modules, org.picketlink, required for running an IDP in conjunction with idp-domain and is deployed to that same JBoss EAP instance. IDP.war will serve as an identity provider. To create a service provider, a security domain is created, for example sp-domain, that uses SAML2LoginModule as an authentication mechanism. A web application, for example SP.war, is configured to use additional modules, org.picketlink, and contains a service provider valve that uses sp-domain. SP.war is deployed to an JBoss EAP instance where sp-domain is configured and is now a service provider. This process can be replicated for one or more SPs, for example SP2.war, SP3.war, and so on, and across one or more JBoss EAP instances. In most SSO scenarios, the SP starts the flow by sending an authentication request to the IDP, which sends a SAML response to SP with a valid assertion. This is known as a SP-initiated flow. The SAML 2.0 specifications define another flow, one called IDP-initiated or Unsolicited Response flow. In this scenario, the service provider does not initiate the authentication flow to receive a SAML response from the IDP. The flow starts on the IDP side. Once authenticated, the user can choose a specific SP from a list and get redirected to the SP’s URL. No special configuration is necessary to enable this flow. The IDP, seeing that there is neither a SAML request nor a response, assumes an IDP-initiated flow scenario using SAML. The IDP challenges the user to authenticate. Upon authentication, the IDP shows the hosted section where the user gets a page that links to all the SP applications. The user chooses an SP application. The IDP redirects the user to the SP with a SAML assertion in the query parameter, SAML response. The SP checks the SAML assertion and provides access. A Global Logout initiated at one SP logs out the user from the IDP and all the SPs. If a user attempts to access secured portions of any SP or IDP after performing a global logout, they must reauthenticate. A desktop-based SSO scenario enables a principal to be shared across the desktop, usually governed by an Active Directory or Kerberos server, and a set of web applications which are the SPs. In this case, the desktop IDP serves as the IDP for the web applications. In a typical setup, the user logs in to a desktop governed by the Active Directory domain. The user accesses a web application via a web browser configured with JBoss Negotiation and hosted on the JBoss EAP. The web browser transfers the sign-on information from the local machine of the user to the web application. JBoss EAP uses background GSS messages with the Active Directory or any Kerberos Server to validate the user. This enables the user to achieve a seamless SSO into the web application. To set up a desktop-based SSO as an IDP for a web application, a security domain is created that connects to the IDP server. A NegotiationAuthenticator is added as a valve to the desired web application, and JBoss Negotiation is added to the SP container’s class path. Alternatively, an IDP can be set up similarly to the browser-based SSO scenario but using the desktop-based SSO provider as an identity store. JBoss EAP offers several login modules for SPs to connect to an STS. It can also run an STS (PicketLinkSTS). More specifically, the PicketLinkSTS defines several interfaces to other security token services and provides extension points. Implementations can be plugged in by using configuration, and the default values can be specified for some properties via configuration. This means that the PicketLinkSTS generates and manages the security tokens but does not issue tokens of a specific type. Instead, it defines generic interfaces that allow multiple token providers to be plugged in. As a result, it can be configured to deal with various types of token, as long as a token provider exists for each token type. It also specifies the format of the security token request and response messages. The following steps are the order that the security token requests are processed when using the JBoss EAP STS. A client sends a security token request to PicketLinkSTS. PicketLinkSTS parses the request message and generates a JAXB object model. PicketLinkSTS reads the configuration file and creates the STSConfiguration object, if needed. It obtains a reference to the WSTrustRequestHandler from the configuration and delegates the request processing to the handler instance. The request handler uses the STSConfiguration to set default values when needed, for example when the request does not specify a token lifetime value. The WSTrustRequestHandler creates the WSTrustRequestContext and sets the JAXB request object and the caller principal it received from PicketLinkSTS. The WSTrustRequestHandler uses the STSConfiguration to get the SecurityTokenProvider that must be used to process the request based on the type of the token that is being requested. It invokes the provider and passes the constructed WSTrustRequestContext as a parameter. The SecurityTokenProvider instance processes the token request and stores the issued token in the request context. The WSTrustRequestHandler obtains the token from the context, encrypts it, if needed, and constructs the WS-Trust response object containing the security token. PicketLinkSTS dictates the response generated by the request handler and returns it to the client. An STS login module, for example STSIssuingLoginModule, STSValidatingLoginModule, SAML2STSLoginModule, and so on, is typically configured as part of the security setup of a JEE container to use an STS for authenticating users. The STS may be collocated on the same container as the Login Module or be accessed remotely through web service calls or another technology. One way of understanding how JBoss EAP security and its components work together is to view in context of real scenarios. The following sections cover several generalized but realistic situations that involve the various JBoss EAP security components and configuration options. They focus on how an application or set of applications is secured as well as how the management interfaces are secured. This scenario shows how JBoss EAP and a sample application are secured when no configuration changes are made after the initial installation. An application, sampleApp1.war, is deployed and configured to use container-based security. 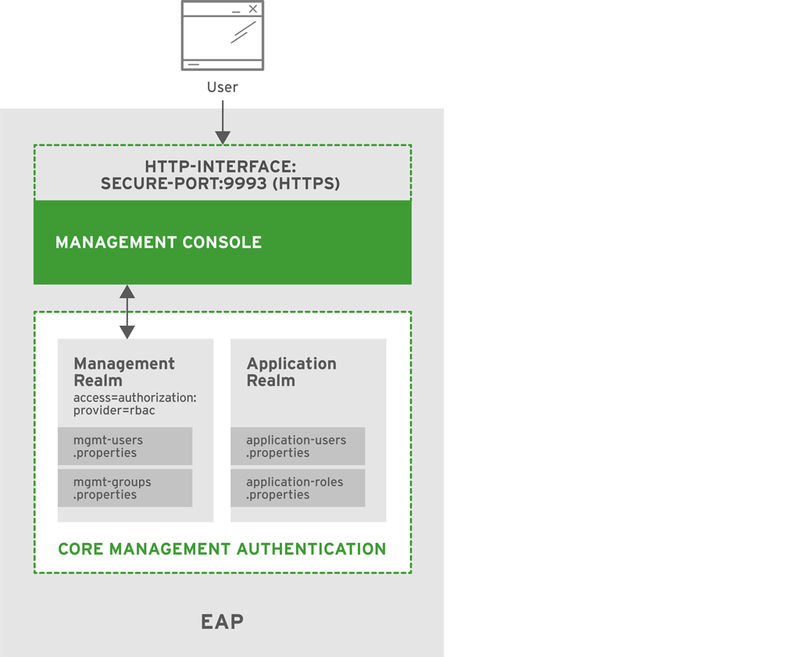 The Core Management Authentication offers two preconfigured security realms by default: ManagementRealm and ApplicationRealm. These realms use property files to store the usernames, passwords, and roles. The ManagementRealm, which is used to store the authentication information and the management APIs, also defines and enables local authentication for users using the CLI on the same host as the JBoss EAP instance. The ApplicationRealm is preconfigured to store authentication and authorization information but for use with other applications besides the management APIs. In addition, ApplicationRealm comes preconfigured with local authentication enabled, but it is not commonly used. On startup, the JBoss EAP instance loads the ManagementRealm and ApplicationRealm security realms. If Susan attempts to access either of the management interfaces, HTTP or CLI, she is required to authenticate. Her username, password, and roles must match an entry in the ManagementRealm security realm. By default, no roles are required to access the management APIs. Sarah and Frank would not be able to access the management APIs because they are not in the ManagementRealm security realm. The security subsystem comes preconfigured with four security domains: other, jboss-web-policy, jboss-ejb-policy, and jaspitest. The other security domain performs authentication and authorization by delegating to the realm specified in the login module, which uses ApplicationRealm by default. Additional information about the default security realms and the default security domains can be found in the Security Realms and Security Domains sections. The application sampleApp1.war has two HTML files, /hello.html and /secure/hello.html, and uses basic HTTP authentication to secure the path /secure/*. It uses the other security domain and requires the role of sample. Because the other security domain defers to ApplicationRealm for its authentication and authorization information, refer to the users in the Users table from the previous section. When Sarah requests /hello.html, she is able to view the page without authenticating. When Sarah tries to request /secure/hello.html, she is prompted to enter her username and password. She is able to view /secure/hello.html after successfully logging in. Frank and Susan, or any user, can access /hello.html, but neither can access /secure/hello.html. Frank does not have the sample role, and Susan is not in the ApplicationRealm security realm. This scenario shows how JBoss EAP is secured when HTTPS is enabled for the management interfaces and RBAC is added to the ManagementRealm security realm. JBoss EAP provides support for using HTTPS with the management interfaces, which includes the management console. HTTPS can be enabled by configuring the secure-interface element, adding a secure-port to the http-interface section of the management interface, and configuring an existing or new security realm with the desired settings, for example, server-identities, protocol, keystore, alias, and so on. This enables the management interfaces to use SSL/TLS for all HTTP traffic. For more background information on HTTPS and securing the management interfaces in general, see the Advanced Security section. JBoss EAP also offers the ability to enable RBAC on the management interfaces using a couple of different authentication schemes. This example uses username and password authentication with the existing property files used in the ManagementRealm. RBAC is enabled by setting the provider attribute to rbac for the management interface and updating the ManagementRealm with the desired users and roles. On startup, JBoss EAP loads the ManagementRealm, with the RBAC configuration, and management interfaces as part of the core services, which also starts the http-interface, configured for HTTPS, for the management interfaces. Users now access the management interfaces via HTTPS, and RBAC has also been enabled and configured. If RBAC is not enabled, any user in the ManagementRealm security realm is considered a SuperUser and has unlimited access. Because RBAC has been enabled, each user is now restricted based on the roles they have. Suzy, Tim, Emily, Zach, and Natalie have different roles, which are shown in the table above. For example, only Suzy and Tim can read and modify access control information. Suzy, Tim, and Emily can modify runtime state and other persistent configuration information. Zach can also modify runtime state and other persistent configuration information but only related to application resources. Suzy, Tim, Emily, Zach, and Natalie can read configuration and state information, but Natalie cannot update anything. For more details on each of the roles and how JBoss EAP handles RBAC, see the Section 2.1.9, “Role-Based Access Control” and Section 2.2.2.3, “Adding RBAC to the Management Interfaces” sections. This scenario shows how a sample application running on JBoss EAP is secured when a new security domain is added and HTTPS is enabled. An application, sampleApp2.war, is deployed that is configured to use container-based security, sample-domain, and HTTPS. JBoss EAP provides support for using HTTPS for use with applications, which is handled using the undertow subsystem. A new connector for HTTPS is added to the undertow subsystem and is configured with the desired settings, for example, protocol, port, keystore, and so on. Once the configuration is saved, web applications can start accepting HTTPS traffic on the configured port. A new security domain called sample-domain has been added, and it uses the IdentityLoginModule for authentication. sampleApp2.war is configured to use sample-domain to authenticate users. On startup, JBoss EAP loads the core services and starts the undertow and security subsystems that manage the HTTPS connections for all web applications and the sample-domain, respectively. sampleApp2.war is loaded and looks for sample-domain for providing authentication and authorization for its secured URLs. sampleApp2.war has two HTML files, /hello.html and /secure/hello.html, and uses basic HTTP authentication to secure the path /secure/*. It uses the sample-domain security domain and requires the role of sample. When Vincent requests /hello.html, he is able to view the page without authenticating. When Vincent tries to request /secure/hello.html, he is prompted to enter his username and password. After successfully logging in, he is able to view /secure/hello.html. All other users can access /hello.html without logging in, but none can access /secure/hello.html because Vincent is the only user in sample-domain. This also applies to all traffic handled over HTTPS. This scenario shows how web applications make use of clustered and non-clustered SSO on JBoss EAP. Four JBoss EAP instances are created: EAP1, EAP2, EAP3, and EAP4. EAP1 and EAP2 operate as standalone servers, and EAP3 and EAP4 operate as a two-node cluster. Two web applications, sampleAppA and sampleAppB, have been deployed to each of the four JBoss EAP instances. All four JBoss EAP instances have also been configured to start up with either the standalone-full-ha or full-ha profile, which adds the infinispan subsystem and other functionality needed for enabling SSO in this scenario. The web cache-container and SSO replicated-cache have also been added, and the undertow subsystem has been configured to use them both. 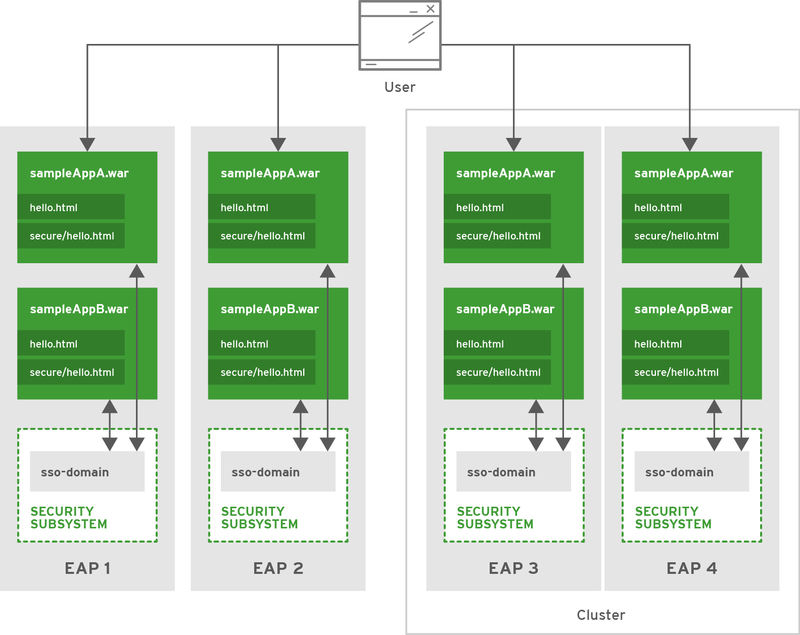 EAP1 and EAP2 have configured their undertow subsystems for non-clustered SSO, while the cluster containing EAP3 and EAP4 has been configured to use clustered SSO. There is a distinct difference between a clustered web application and clustered SSO. A clustered web application is one which is distributed across the nodes of a cluster to spread the load of hosting that application. In clustered applications marked as distributable, all new sessions and changes to existing sessions are replicated to other members of the cluster. Clustered SSO allows for replication of security context and identity information, regardless of whether the applications are themselves clustered. Although these technologies may be used together, they are mutually exclusive and may be used independently. On startup, JBoss EAP loads the core services and starts the security, undertow, and infinispan subsystems that manage sso-domain and the associated caching for SSO information. sampleAppA.war and sampleAppB.war are loaded on all four JBoss EAP instances, each of which look for sso-domain for providing authentication and authorization. If Jane attempts to access EAP1/sampleAppA/secure/hello.html, she will be asked to authenticate. After providing the correct information, she will be allowed to see EAP1/sampleAppA/secure/hello.html. Jane’s session will be added in the SSO caches used by the undertow and infinispan subsystems. If she attempts to access EAP1/sampleAppB/secure/hello.html, she will not be asked to re-authenticate. sampleAppB running on EAP1 will find her session using the undertow subsystem caches, along with the infinispan subsystem, and grant her access because she is already authenticated. If Jane attempts to access either EAP2/sampleAppA/secure/hello.html or EAP2/sampleAppB/secure/hello.html, she will be asked to authenticate again because EAP1 and EAP2 do not share a cache. If Jane attempts to access EAP3/sampleAppA/secure/hello.html, she will be asked to authenticate and her session will be stored in the SSO caches. These caches are stored across the entire cluster, so if Jane attempts to log into EAP3/sampleAppB/secure/hello.html, EAP4/sampleAppA/secure/hello.html, or EAP4/sampleAppB/secure/hello.html, she will not have to reauthenticate. If either EAP3 or EAP4 are restarted, Jane’s SSO information will remain in the cache because the other JBoss EAP instance and the cluster remain running, thus preserving the cache. Similarly, if Jane’s session is invalidated, it ripples across the cache, and she will be asked to re-authenticate regardless of which application or server she tries to access in the cluster. This scenario shows how multiple instances of JBoss EAP are secured and browser-based SSO is added. Three separate, non-clustered JBoss EAP instances are configured: EAP1, EAP2, and EAP3. Three sample applications: sampleAppA.war, sampleAppB.war, and sampleAppC.war, are configured to use browser-based SSO for authentication. JBoss EAP provides support for doing browser-based SSO via SAML with web applications as well as hosting an identity provider. To host an identity provider, a security domain, in this case named idp-domain, must be configured with an authentication mechanism defined. In this case, idp-domain is configured to use the DatabaseLoginModule as the authentication mechanism. The IDP application, for example IDP.war, is deployed to that JBoss EAP instance, in this example EAP-IDP, and configured to use idp-domain as its identity store. IDP.war uses the identity store in combination with functionality in the application to authentication users as well as issue SAML tokens containing the user’s identity and role information. Three additional JBoss EAP instances: EAP1, EAP2, and EAP3, each host one distinct application that will serve as an individual SP, sampleAppA.war, sampleAppB.war, and sampleAppC respectively. Each JBoss EAP instance has a security domain, sso-domain, configured to use the SAML2LoginModule as the authentication mechanism. Each application contains functionality to support SSO, use IDP.war as an identity provider, and use HTTP/POST binding for authentication. Each application is also configured to use sso-domain to secure the path /secure/* and supplies its own list of roles for handling authorization. On startup of EAP-IDP, the management interfaces start, followed by the subsystems and deployed applications, including the security subsystem, which includes idp-domain, and IDP.war. idp-domain connects to the database and loads the usernames, passwords, and roles as configured in the DatabaseLoginModule login module. To prevent sensitive information from being stored in plain text in the configuration of the DatabaseLoginModule login module, password hashing is configured to obscure certain fields, for example, password for the database. IDP.war uses idp-domain for authentication and authorization. IDP.war is also configured, using jboss-web.xml, web.xml, picketlink.xml, and jboss-deployment-structure.xml, to issue SAML tokens to authenticated users and supplies a simple login form for users to authenticate against. This allows it to serve as an IDP. On startup of EAP1, EAP2 and EAP3, the management interfaces start, followed by the subsystems and deployed applications, including the security subsystem, which includes sso-domain on each instance, and sampleAppA.war, sampleAppB.war, and sampleAppC.war, respectively. sso-domain is configured to use the SAML2LoginModule login module but relies on the application to supply the proper SAML token. This means any application using sso-domain must properly connect to an IDP to obtain a SAML token. In this case, sampleAppA, sampleAppB, and sampleAppC are each configured, via jboss-web.xml, web.xml, picketlink.xml, and jboss-deployment-structure.xml, to obtain SAML tokens from an IDP, IDP.war, using that IDP’s login form. When an unauthenticated user attempts to access the URLs secured by sso-domain, that is, /secure/*, of any application, that user is redirected to the login page at IDP.war. The user then authenticates using the form and is issued a SAML token containing their identity and role information. The user is redirected to the original URL, and their SAML token is presented to the application, SP. The application ensures the SAML token is valid and then authorizes the user based on the roles provided by the SAML token and the ones configured in the application. Once a user is issued a SAML token, they use that token to be authenticated and authorized on the other applications secured by SSO using the same IDP. Once the SAML token expires or becomes invalidated, the user will be required to obtain a new SAML token from the IDP. In this example, if Eric accesses EAP1/sampleAppA/secure/hello.html, he is redirected to EAP-IDP/IDP/login.html to log in. After successfully logging in, he is issued a SAML token containing his user information and the role all and is redirected to EAP1/sampleAppA/secure/hello.html. His SAML token is presented to sampleAppA to be checked and to authorize him based on his roles. Because sampleAppA allows the roles all and AB to access /secure/* and Eric has the role all, he is allowed to access EAP1/sampleAppA/secure/hello.html. If Eric tries to access EAP2/sampleAppB/secure/hello.html, because he is not already authenticated against that SP, he is redirected to IDP.war with an authentication request. Because Eric has already authenticated against the IDP, he is redirected to EAP2/sampleAppB/secure/hello.html by IDP.war with a new SAML token for that SP without having to re-authenticate. sampleAppB checks his new SAML token and authorizes him based on his role. 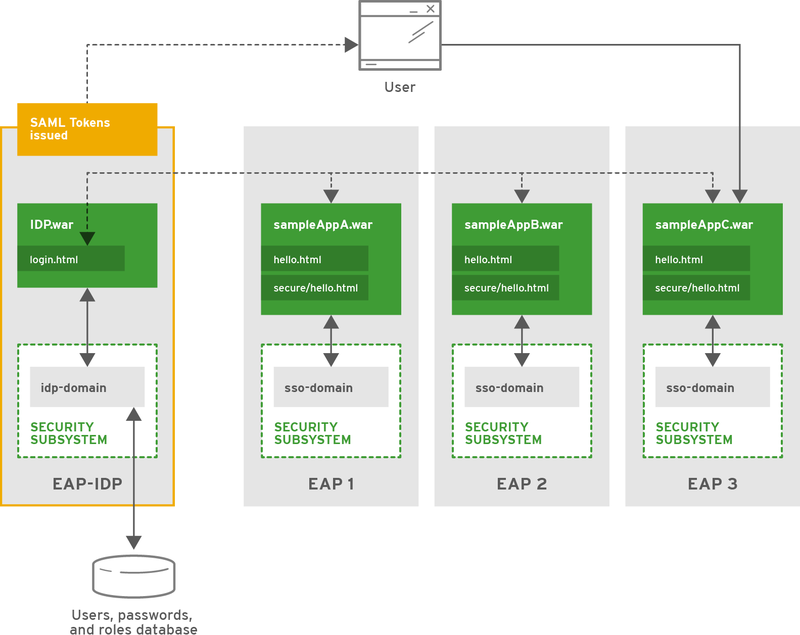 Because sampleAppB allows the roles all and AB to access /secure/* and Eric has the role all, he is allowed to access EAP2/sampleAppB/secure/hello.html. The same thing would apply if Eric were to try to access EAP3/sampleAppC/secure/hello.html. If Eric were to return to EAP1/sampleAppA/secure/hello.html, or any URL under EAP2/sampleAppB/secure/* or EAP3/sampleAppC/secure/*, after his SAML token became invalidated via global logout, he would be redirected to EAP-IDP/IDP/login.html to authenticate again and be issued a new SAML token. If Amar attempted to access EAP1/sampleAppA/secure/hello.html or EAP2/sampleAppB/secure/hello.html, he would be directed through the same flow as Eric. If Amar attempted to access EAP3/sampleAppC/secure/hello.html, he would still be required to have or obtain a SAML token but would be restricted from viewing EAP3/sampleAppC/secure/hello.html because his role AB only allows him to access EAP1/sampleAppA/secure/* and EAP2/sampleAppB/secure/*. Brian is in a similar situation, but he is only allowed to access EAP3/sampleAppC/secure/*. If Alan tries to access any service provider’s secured area, he would still be required to have or obtain a SAML token but would be restricted from seeing anything because he has no role. Each SP also has an unsecured area which any user, authorized or not, can view without obtaining a SAML token. This scenario shows the ManagementRealm using LDAP for securing the management interfaces. A JBoss EAP instance has been created, EAP1, and is running as a standalone server. 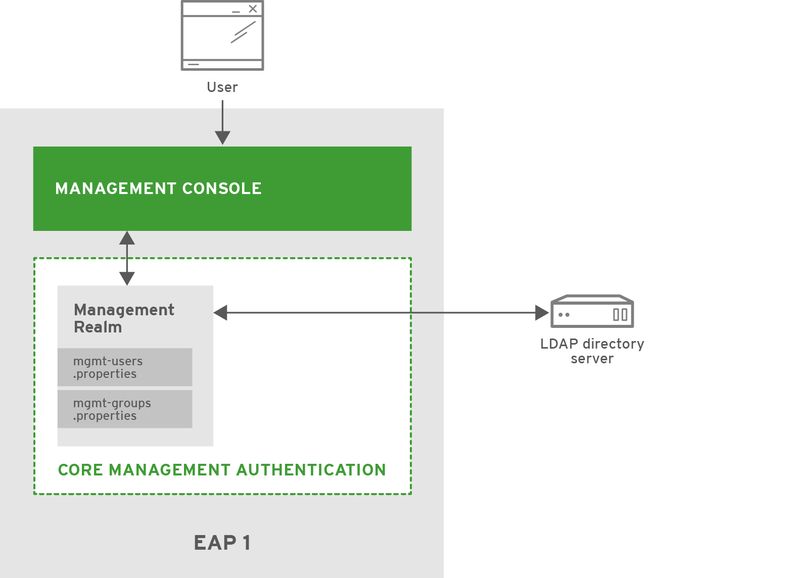 The ManagementRealm on EAP1 has also been updated to use LDAP as the authentication and authorization mechanism. JBoss EAP supports using LDAP, as well as Kerberos, for authentication in security realms. This is accomplished by updating the existing ManagementRealm to use ldap as the authentication type and creating an outbound connection to the LDAP server. This changes the authentication mechanism from digest to BASIC / Plain and will transmit usernames and passwords in the clear over the network by default. On startup, EAP1 loads the core services, including ManagementRealm and the management interfaces. ManagementRealm connects to the LDAP directory server and provides the authentication for the management interfaces as needed. If Adam` attempts to access a management interface, he will be forced to authenticate. His credentials will be passed to the ManagementRealm security realm, which will use the LDAP directory server for authentication. Since EAP1 is using the default simple access controls, after authentication, Adam’s roles will not be checked and he will be granted access. The same process will occur if Sam attempts to access the management interface. If RBAC was enabled after Adam is authenticated, his roles would be passed back to the management interface for authorization. Because Adam has the SuperUser role, he would be granted access to the management interface. If Sam attempted to access a management interface with RBAC enabled, he would be authenticated via LDAP but would be denied access because he does not have a proper role. This scenario shows how Kerberos can be used with JBoss EAP to provide SSO for web applications. A JBoss EAP instance has been created, EAP1, and is running as a standalone server. Two web applications, sampleAppA and sampleAppB, have been deployed to EAP1. Both the web applications and EAP1 have been configured to authenticate using desktop-based SSO via Kerberos. JBoss EAP offers support for using Kerberos for SSO in web applications via SPNEGO and JBoss Negotiation. For more information on the specifics of Kerberos and SPNEGO, please see the Section 1.6.1, “Third-Party SSO Implementations” section. To enable JBoss EAP and deployed web applications to use Kerberos for authentication, two security domains must be created. The first security domain, host-domain, is configured with the kerberos login module to connect to the kerberos server. This allows JBoss EAP to authenticate at the container level. A second security domain, spnego-domain, is created with two login modules. One uses the spnego login module to connect to host-domain to authenticate users. The second can use any other login module to load role information for use in authorization decisions, for example, UsersRoles using properties files to map users to roles. These two login modules also make use of password-stacking to map the users and roles in the authorization module with the users in the authentication login module. EAP1 is configured with both host-domain and spnego-domain. Applications are configured, via web.xml and jboss-web.xml, to use spnego-domain to perform authentication and get a user’s roles for authorization. Applications can also be configured with FORM authentication as a fallback authentication mechanism in case the security tokens cannot be passed from the operating system to the browser. If FORM authentication is configured as a fallback, an additional security domain must be configured to support it. This security domain is independent of Kerberos and SPNEGO and only has to support FORM authentication, that is, username and password validation and roles. Each application is configured to use spnego-domain and to provide FORM authentication as a fallback. Each application is also configured to secure the path /secure/* and supplies its own list of roles for handling authorization. On startup, EAP1 loads the core services, followed by the security and other subsystems. 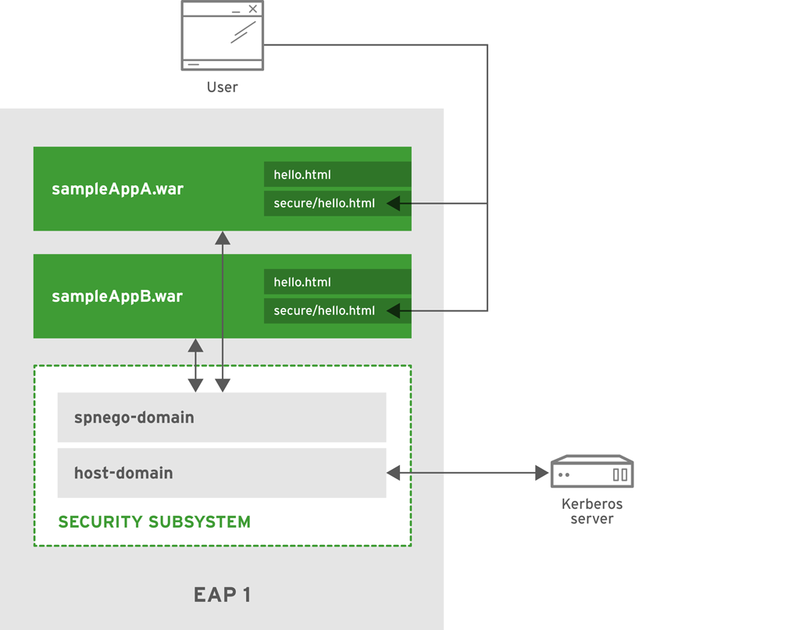 host-domain establishes a connection to the Kerberos server, and spnego-domain connects to host-domain. sampleAppA and sampleAppB are deployed and connect to spnego-domain for authentication. Brent has logged in to a computer that is secured with Kerberos. He opens a browser and attempts to access sampleAppA/secure/hello.html. Because that is secured, authentication is required. EAP1 directs the browser to send a request for a key to the Kerberos server, specifically the Kerberos Key Distribution Center that is configured on his computer. After the browser obtains a key, it is sent to simpleAppA. simpleAppA sends the ticket to spnego-domain, where it is unpacked and authentication is performed by host-domain, in conjunction with the configured Kerberos server. Once the ticket is authenticated, Brent’s role is passed back to simpleAppA to perform authorization. Because Brent has the all role, he will be able to access sampleAppA/secure/hello.html. If Brent tries to access sampleAppB/secure/hello.html, the same process will occur. He will be granted access, due to him having the all role. Andy and Bill would follow the same process, but with Andy only having access to sampleAppA/secure/hello.html and not sampleAppB/secure/hello.html. Bill would be the opposite, having access to sampleAppB/secure/hello.html and not sampleAppA/secure/hello.html. Ron would pass authentication to either sampleAppA/secure/hello.html or sampleAppB/secure/hello.html but would not be granted access to either because he has no role. If Andy were to attempt to access sampleAppA/secure/hello.html from a computer not secured by Kerberos, for example a personal laptop connected to the office network, he would be directed to the FORM login page as a fallback login mechanism. His credentials would then be authenticated via the fallback security domain and the process would continue with authorization.